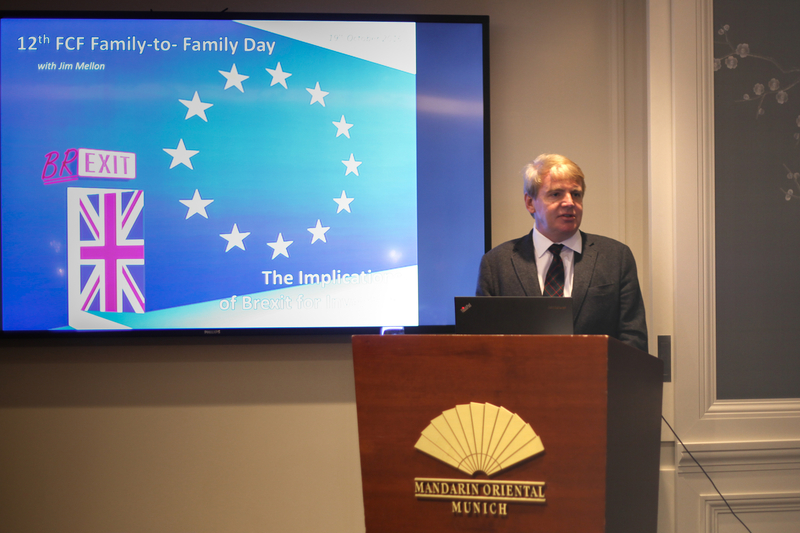 On October 19th 2016, FCF Fox Corporate Finance GmbH successfully hosted its 12th investor conference, the FCF Family-to-Family Day – with Jim Mellon as a speaker. During the conference, the following companies were presented to the audience of approx. 50 attending family office representatives and high net worth individuals: MBB SE, (a listed industrial holding company), SHW AG, a listed producer of Pump-components and break discs, First Sensor AG, a listed producer of sensor technology, SNP Schneider- Neureither & Partner AG, a listed IT consulting firm, as well as censhare AG, a non-listed, privately owned venture for marketing- and communication software. The day was rounded off with an exciting speech by Jim Mellon, a well-known English investor and Eurosceptic, on the reasons for the UK’s BREXIT vote. His views on the ramifications of BREXIT on the financing of the EU debt by Germany in the framework of the target 2 balances led to lively discussions during the following dinner at the Matsuhisa restaurant in the Mandarin Oriental Hotel that concluded the evening.